Abstract: The 181B series uses a 18.1" a-si TFT/PVA (Pattern Vertical Alignment) 1280x1024 resolution screen for viewing comparable to that of a 19" CRT display. The 181B is not yet available to consumers, but with an estimated retail price of about @1200USD for an 18.1" LCD display, it will offer a step up in screen real estate from the silver 171B we reviewed previously. I remember talking with some at last years COMDEX about why some LCD's were coloured silver or black but that most remained a very boring beige. Believe it or not, in order to qualify for certain health and safety standards (in particular reflection) that many large corporations, governments and organizations adhere to, beige is the shade that meets the specs. If the product does not qualify for even one of the many standards that these bulk purchases require the product cannot be considered, thus a very profitable market is missed. Personally, I think the silver and black 171 looks a lot nicer, but that's just my opinion. Thin seems to be the name of the game with LCD's this year, and if the Über secret product planers we get to glimpse at are any indication, bezel thickness is going to be sliming way, way down. Getting back to the 181B the first thing which will strike you is the novel placement of the main control panel. Rather than dropping it in the same place below the LCD, Samsung have moved it over to the right hand side. The change is a good one, but in low light the embossed descriptions are near impossible to read. There is a plastic lazy susan in the base of the stand but there is too much friction for it to move easily from side to side, so the whole stand moves instead. While there are no vertical adjustments with this particular stand, other optional stands can be had which will bring one or two inches of vertical travel to the 181B. Forward and back tilting is easy to manipulate, and with just an analog video connection the 181B is being focused on the corporate world with both guns blazing - simple, no frills, and easy to deploy into an aging computer network. 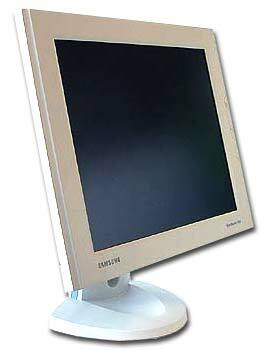 The 181B series uses a 18.1" a-si TFT/PVA (Pattern Vertical Alignment) 1280x1024 resolution screen for viewing comparable to that of a 19" CRT display. The TFT panel is capable of displaying 16.7 Million colors, and features a 0.281mm dot pitch, contrast ratio of 400:1, brightness of 250 cd/m2, pixel response time of 25ms and very wide viewing angles of (80/80/80/80). The display connects to the computer by an analogue VGA cable only which is a downside for users of DVI enabled video cards, but a plus for people with older systems. About the only feature of the 181B is a space on the rear of the stand for an optional USB Hub. This is one of the few times I wish buttons were backlit, or at least embossed with a darker shade. The novel approach of discreetly incorporating the control buttons on the side of the monitor works well (heck you hardly notice them when working), but in low light the icons are almost unreadable. The power button has a little LED behind it so things are not a total loss, but it is something tho think about if you work in a dimly lit area. The controls consist of small flush mounted buttons that are grouped into two sections of three (six in totally). From top to bottom we have the back lit power switch, then menu, +brightness, -brightness, exit and all important autoadjust key.